UBC Learning Circle webinars feature presentations, discussions, lectures, and workshops that are transmitted over the web, while inviting participants to communicate with presenters. All that is required to attend our sessions by webinar is a computer with an internet connection and speakers. The UBC Learning Circle recently underwent changed webinar platforms from Cisco WebEx to Zoom, which is a more user-friendly platform! The UBC Learning Circle has two different methods to connect to our live and interactive learning sessions. We’ve put together a post to help you choose which method works best for you. This page is here to help you easily make the transition and troubleshoot a couple of common problems. Polycom HDX series videoconference: camera, codec, microphone, and remote. Videoconference provides real-time two-way audio/video communication between two or more locations. Video conferencing requires specialized equipment on both ends for a successful connection. The UBC Learning Circle currently has video conference equipment in over 90 First Nations communities across BC. Videoconference units use the Internet (like a computer) to send and receive information. Videoconferencing is the best choice for interaction and engagement that is nearly as good as meeting in person because you can see and hear all of the other participants connected to a session, usually on a large screen television in a boardroom-like setting. What’s Required for a Videoconference? Commonly used videoconference systems include PolycomVSX 7000, HDX-6000-7000-8000-9000, or Cisco C20 or SX20. 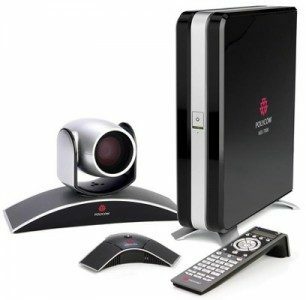 Regardless of the manufacturer and model number, every videoconference unit has a ‘codec,’ which is the part of the machine that functions like a computer and allows users to connect to other locations by dialing an IP address. Camera: The camera attaches to the unit with a specialized cable. Microphone: The remote may look like a ‘spaceship’ and attaches to the codec unit by a long USB cable. Remote: Most units will have a remote control (not touch screen). See below for detailed information on how to use your remote control. The videoconference unit can ‘dial’ out to other videoconference units, but it is not a telephone. Like your computer, the videoconference uses the Internet to connect to other users. When you call another health centre, you will enter in an IP address (series of numbers) that is specific to the other videoconference unit. Every device connected to the Internet has a unique IP address which helps them to communicate with each other. For example, the UBC Learning Circle’s IP address is 184.70.6.62. You can hook up any television to your videoconference unit as long as it has the appropriate ports and cables. Click here to download some helpful instructions for your HDX remote control. If you have a Polycom videoconference system, you can download the user’s guide . Still need a hand? For technical support with your videoconference equipment for our online events, please call 1-844-364-7878 or email eHealthSupport@fnha.ca. A computer webinar is a specific type of web conference that is typically one-way (speaker to the remote audience with limited remote audience interaction). All that is required to attend our sessions by webinar is a computer with internet connection and speakers. The UBC Learning Circle webinars allow participants to both see and hear the presenters. You can interact with the presenters by typing your questions and comments into the “chat window” in the lower right-hand corner of the screen. The Learning Circle facilitator will relay your questions and comments to the presenters. Due to technical limitations, you will not be able to speak with the presenter, nor are participant webcams enabled for our sessions. Why should you attend a webinar? There is no travel required for attending a webinar. You can sit wherever you like to attend the seminar. Our webinars are interactive giving you the opportunity to ask questions. So it’s sort of like watching a video BUT you can communicate with the speaker. Although webinars are live events, they are archived and can be watched at a later time on the UBCLC YouTube channel. However, the option of asking questions and interacting is no longer available. No special equipment is required for attending a webinar. Basics like a computer, access to internet connection and headphones are all you need. So, always remember to attend webinars as it will enhance your knowledge, improve your health, and give you access to some information that you may need, allowing you to take better decisions. If you are experiencing problems, please head to our Webinar Technical Support page.